Perhaps it could have been, with a stronger melody and a more refined concept. The song itself is pretty good, but Evans turns in a listless performance, delegating all of the “oomph” to the background vocalists and studio musicians. And they’re pretty listless in their own right. Evans has produced some great variations on the “wronged woman slowly discovers her own self-worth” theme before. But the charm and the wit and the personality of her best songs of this nature – “Fool, I’m a Woman”, “Cheatin'”, “Shame About That” – are completely absent this time around. I hate to say it, but it reminds me of post- “Girls Lie Too” Terri Clark, where a woman that seemed on the cusp of really big stardom suddenly loses her knack for finding strong material and spinning it into a golden performance. What a disappointment. 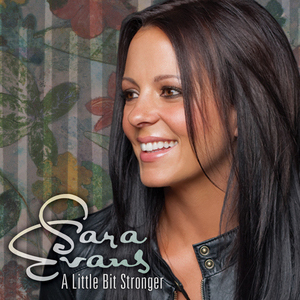 Sara Evans had alot of potential, but what happened? The fire just went out, barely even smoke left now. She lost me on those live performances on all the award show circuits about 3-5 years ago. The pitch was totally off. Yeah, this feels like a blandly rewritten version of Brooks and Dunn’s “It’s Getting Better All The Time.” Couldn’t agree more with this review, or on Sara Evans’ potential. Even if she can’t reclaim her previous success on radio, I’m hopeful that she at least finds some more interesting music. Agreed with this review. Hilary should have kept this song for Lady A. Her voice sounds boring or computerised or something, it doesnt move me like it should. Don’t care for the production like I didn’t with ‘Feels Like A Love Song’ Has she forgot the lesson she taught herself when ‘Suds in The Bucket’ was deemed too country for radio and everyone thought she was crazy for releasing it, and what happened? She got herself a career song. She’s playin it too safe here like ‘Love Song’ which couldn’t cut through the clutter. I can’t help but thinking, her last studio album was released in 2005 so shes had a good 5 years to find a killer track, whether she wrote it herself or found one from the thousands of songs being written a year, and this is the best one? It seems like its getting harder and harder to find good material these days. There’s a half written song scribbled on a peice of paper on Lori McKenna’s nightstand right now that should have ended up being this song. Yes, Evans has had five years to do better than this and she hasn’t even found one song that’s been decent in those years. It’s difficult not to simply give up on her. I actually think I have come to expect this as the new norm for her though, since I didn’t expect anythingg better than this when I heard she had released a new single. That’s unfortunate,, since I really respected her music once. I agree that she really sounds disconnected with this song.While there are times that I don’t mind the production, the overwrought instrumental break before the bridge is frustrating. It kills me to admit it, since I was expecting so much, but Kevin is right. I think the song itself is very good. I’ve heard a few live versions of this song that I thought sounded great, but the studio version was a bit of a disappointment. I thought the drumbeat in the chorus was distracting, and for once Sara’s performance does sound a bit “listless.” That’s the biggest disappointment of all, because she used to be able to elevate a decent song into a great one with her amazing vocals. I think that Cory DeStein got it right when he said that “She lost me on those live performances on all the award show circuits about 3-5 years ago. The pitch was totally off.” I had the same reaction. I wonder if that’s something correctable with vocal lessons. At one time she was on the top of my concert wish list but I never got to see her. I loved songs like “Imagine That”, “Four-Thirty” and “Fool, I’m a Woman” and thought she was headed for a great career. I totally disagree with this review, and when she has a #1 hit with it, all of you will stand corrected. I’m going out on a limb here and don’t mind being corrected when I’m wrong, but judging by her track record in the last few years, I’m seriously doubting that this will be the song to take her to number one. If it goes #1, I’ll be happy for her, but it won’t change my opinion of the song. I think she’d have a difficult time getting to #1 even with a better song, considering how long it’s been since she’s had a bonafide hit. She’s also pushing 40, which is when radio tends to put a lot of female artists out to pasture. I think she’s peaked commercially. If it goes into the Billboard top 20, email me and I will buy you any album of your choice. Like Kevin said, I’ll be happy for her if she regains popularity, but I won’t like the song any better. Then again, I would only be so happy for her, since I don’t like it when an artist is rewarded when recording a poor song. Unfortunately, I’ve always felt that Sarah Evans was more of a studio creation than a performing artist, so she needs hit records to keep the crowds coming. Sarah Evans did Low and that was an amazing song. So I would say that everything but Low has been average at very best from her. Born to Fly, Back of a Greyhound Bus, Cheatin’, Suds in the Bucket and A Real Fine Place to Start almost seem like another artist was recording those songs, not this same Sara Evans. …all this voice needs is a couple of songs with a melody, rhythm and some steel in it – how difficult can it be for a seasoned star and her team to figure that out. this tune is as memorable and interesting as a seven years old nissan on a used cars lot. It makes me wonder who is really in charge of picking out her songs. Martina McBride is pretty much in the same situation; it’s been a long time since she did anything interesting. I’ll have to go back and listen to “Low” again. I don’t remember especially liking it. I loved “Low”, and enjoyed “As If”, but everything else post-“Real Fine Place” has been mediocre at best, to my ears at least. I think “Low” was the last great single we’ve heard from Sara. “Feels Just Like a Love Song” was average, and the production was cluttered, but her vocals were spot on. It’s a bummer that this time her vocals aren’t quite up to par, though I didn’t really notice at first until Kevin pointed it out in the review. Even if Sara never does find her way back onto the charts, I hope she can least get back to giving us high quality recordings like those she gave us in her heyday. Her album “Restless” was such a huge peak-I loved that album. Then “Real Fine Place” came out, and rather than finding a bunch of great quality songs to make an album out of, she seemed to put together an album of a bunch of songs she thought would be hits…the flow of that album just didnt work for me. Sure it had hits, but aside from the title track nothing really stuck out, and her career slowed down significantly afterwards. In my opinion she has had one of the biggest down falls in material quality. After listening to this song a few more times, I think the vocal isn’t necessarily disconnected – just a low-key interpretation, but still believable. She just chose not to belt it out like Carrie or Martina. I hear a few people criticizing the quality of the song itself, so I’m just going to chime in and say that I think it is a remarkably well-written song – sad, but optimistic, and you can hear the narrator’s resolve getting progressively stronger. I don’t just say that because I love Sara Evans – I would have been just as impressed if Hillary had kept the song and recorded it with Lady A.
I think there’s a difference between being connected and belting and I also think there’s a difference between being low key and being disengaged. For me, Evans sounds disengaged/disconnected. While Since you bring up Martina, she’s a great case study in what I’m talking about. If you hear her earlier music, she sounds very engaged in what she’s singing, but she doesn’t do the signature belting that she’s known for today. Over all, she’s restrained/relaxed, but you can tell that she’s feeling everything that she’s singing. Nowadays, she belts a lot and she actually seems less connected than she used to. So, ultimately, I don’t equate being a powerhouse or restrained vocalist to sounding emotionally engaged or invested. I personally prefer artists who are more nuanced in their singing. I just don’t hear that at all in Evans’ voice this time around. I guess I don’t think the song is especially well written either. Then again, I’m not the biggest fan of Hillary Scott’s songwriting in general. It’s possible that I would think better of the song with a better production and vocal performance though. I guess I don’t think the song is especially well written either. Neither do I. Repeating “I’m a little bit stronger” a dozen times in a row just doesn’t cut it for me. I think it’s ultimately the melody that kills this song. You have to turn in a really expressive performance to breathe life into this kind of melody, and Sara doesn’t. I actually think Hillary Scott would have done a better job with this song. And I loved “Low,” too. I guess it just comes down to disagreement about the song, but it is really interesting to hear different viewpoints on it. That’s what I love about blogging! I listened to “Low” again and while it’s not one of my favorites of hers, it’s definitely the best thing that she’s done in five years by a long shot. Does anyone have any thoughs on what it should sound like if the artist in fully engaged in the performance? What do you listen for? Just curious. I do like the song, but maybe this is something I just don’t have a very good ear for. It’s probably subjective, really. If it connects with you, you’re not the only one. It just sounds like she’s kind of sleepy or disinterested to me. This song is fantastic; I think it sounds like it will be the hit she needs w/ country radio, they record label seems to be putting a lot of promo into it (music video has already been done for awhile now, its on the soundtrack for Tim McGraw’s new movie), and she sounds fantastic vocally. Also, I think the production is great because they keep it light throughout the verses and then the chorus builds, but still sounds restrained. Interesting to read so many others saying what I’ve been thinking. I can’t believe it’s been five years since Sara was THE BIG THING at Fan Fair and was on her way. Talk about falling off a cliff! Granted, after the nonsense of dropping out of “DWTS” and the ugly divorce smears daily in the Nashville paper, it’s no real surprise. She just didn’t possess the talent to make up for such nonsense. Add to that a touch of “almightyness” because when she was the flava of the day, she was incredibly arrogant and rude to her fans. OH! How the mighty do fall! LOL! Wow, Soul Miners Daughter. That’s pretty cold. Are we listening to the same Sara Evans? She possesses plenty of talent. It’s not talent or lack thereof that’s been her problem. There are plenty of very talented people who can’t sustain chart success. Everybody is totally wrong. The song is already at #43 on the charts last I heard. The music video was #1 for a week straight on CMT.com, people love Sara and everybody’s excited that she’s back. Everybody should go on youtube and check out her song “What That Drink Cost Me” which will be on her new album – you WON’T be dissapointed. I firmly believe 2010 is gonna be the year that Sara is back on the map. There’s gonna be some serious competition this year, & I truly believe Sara has a serious chance. Wooo hooooo!!! #2 Billboard, #3 on mediabase! Sara, what an amazing comeback!